I’ve been keeping my eyes peeled for the past couple of years for any sight of the handful of Yellow teas in the West. So far, nothing. I’m thinking it’s probably only a matter of time though before the desire to turn a tidy profit out-shoots the desire to keep a patently Chinese cultural item local. Until then, I will content myself with a close cousin to one of the Yellow teas (Junshan Yinshen): Bai Hao Yinzhen, or Silver Needle. Silver Needle has long been held as the sought-after White tea in the West, though my experiences with it haven’t demonstrated real superiority to my thinking. Today I’m drinking TeaVana‘s Silver Yin Zhen Pearls. As you can imagine from the price tag, TeaVana likes to handsell this fascinating tea in their brick and mortar shops, but as it happens I came by it from its inclusion in the Forbidden Kingdom gift set. Silver Yin Zhen Pearls’ aroma is quite weak, but it does have a discernible bit of flowery/twigginess, especially emanating from the spent tea. 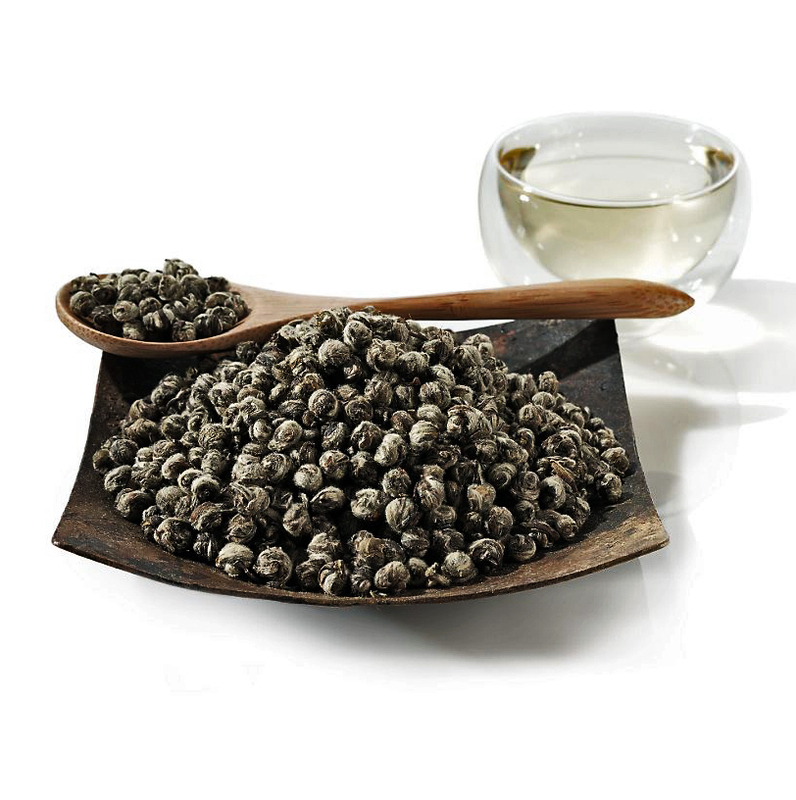 Silver Yin Zhen Pearls has a surprisingly well-rounded flavor, probably the result of the rolled pearls unfurling during brewing. In texture, Silver Yin Zhen Pearls is a tinsy bit thicker and grittier than the average White tea–more on par with the average Chinese Green. It has less of what I’d call a chlorophyllic flavor, and more of what you might call an earthy, blossomy taste (as with Jasmine) or even a straw-like flavor. This well-guarded secret of Chinese emperors is a rare delicacy for a Western table. The world’s rarest and most famous Silver Needle tea is expertly hand-rolled into delicate downy white pearls. The hand-rolling technique captures the full-leaf nutrients while making the leaves more tender, which in turn, releases a slightly stronger flavor into the final brewed cup as compared to traditional Silver Needle. Err, so basically what they’re saying is: it’s the rarest because generally you wouldn’t want to manufacture Silver Needle into pearls–it’d be too costly and too much subtlety would be lost. Probably many Fujian growers would consider it unthinkable. Welcome to the world of retail tea in the West.